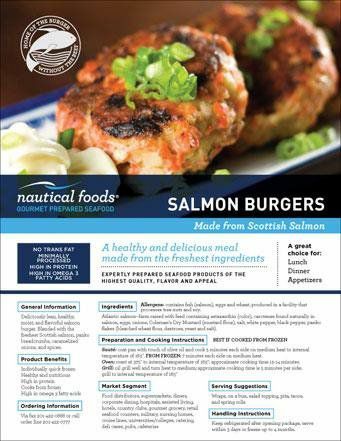 Deliciously lean, healthy, moist, and flavorful salmonburger. 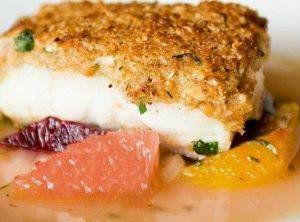 Blended with thefreshest Scottish salmon, pankobreadcrumbs, caramelizedonions, and spices. 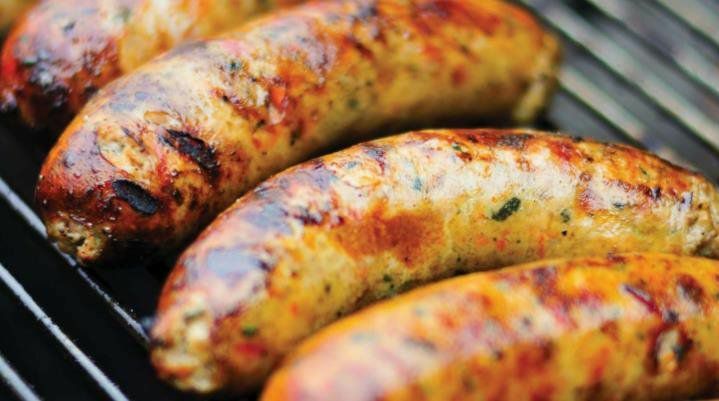 Atlantic salmon--farm raised with feed containing astaxanthin (color), carotenes found naturally insalmon, eggs, onions, Coleman's Dry Mustard (mustard flour), salt, white pepper, black pepper,pankoflakes (bleached wheat flour, dextrose, yeast and salt). Sauté: coat pan with touch of olive oil and cook 5 minutes each side on medium heat to internaltemperature of 165°. FROM FROZEN: 7 minutes each side on medium heat. Oven: roast at 375° to internal temperature of 165°; approximate cooking time 12-14 minutes. 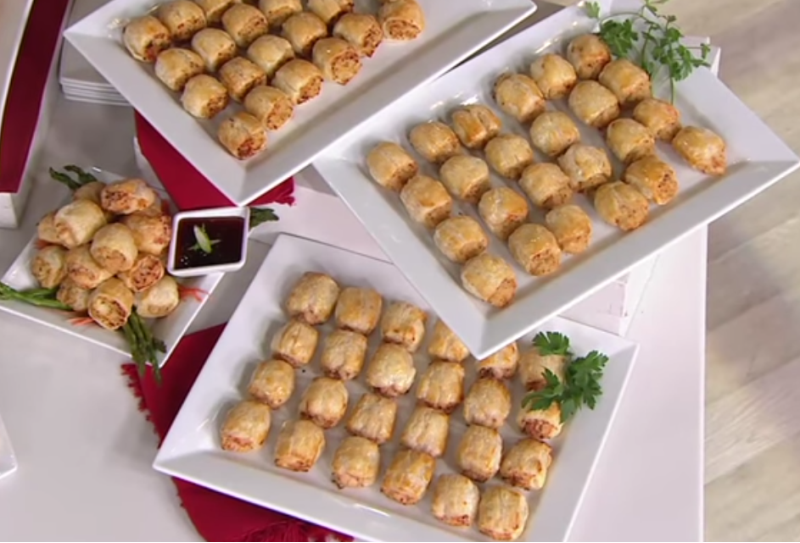 Keep refrigerated after opening package, servewithin 3 days or freeze up to 4 months. 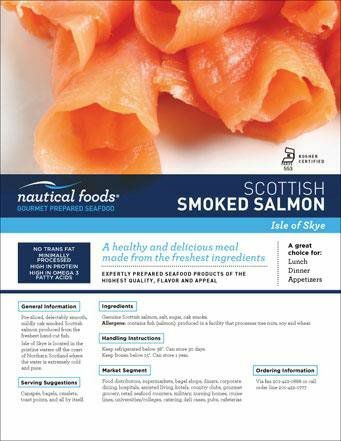 SCOTTISH SMOKED SALMON:NO TRANS FAT MINIMALLY PROCESSED HIGH IN PROTEIN HIGH IN OMEGA 3 FATTY ACIDS.A healthy and delicious meal made from the freshest ingredients.EXPERTLY PREPARED SEAFOOD PRODUCTS OF THE HIGHEST QUALITY, FLAVOR AND APPEAL.A great choice for: Lunch Dinner Appetizers. General Information :Pre-sliced, delectably smooth, mildly oak smoked Scottish salmon produced from the freshest hand-cut fish. Isle of Skye is located in the pristine waters off the coast of Northern Scotland where the water is extremely cold and pure. Serving Suggestions Canapés, bagels, omelets, toast points, and all by itself. Ingredients :Genuine Scottish salmon, salt, sugar, oak smoke. Allergens: contains fish (salmon); produced in a facility that processes tree nuts, soy and wheat. Handling Instructions :Keep refrigerated below 38°. Can store 30 days. Keep frozen below 15°. Can store 1 year. Market Segment :Food distributors, supermarkets, bagel shops, diners, corporate dining, hospitals, assisted living, hotels, country clubs, gourmet grocery, retail seafood counters, military, nursing homes, cruise lines, universities/colleges, catering, deli cases, pubs, cafeterias. SEAFOOD SALAD:NO TRANS FAT MINIMALLY PROCESSED HIGH IN PROTEIN HIGH IN OMEGA 3 FATTY ACIDS.A healthy and delicious meal made from the freshest ingredients.EXPERTLY PREPARED SEAFOOD PRODUCTS OF THE HIGHEST QUALITY, FLAVOR AND APPEAL.A great choice for: Lunch Dinner Appetizers. General Information :Combination of shrimp, squid, octopus, Peppadew peppers, and celery mixed with a flavorful vinaigrette and spices. This is sure to please. 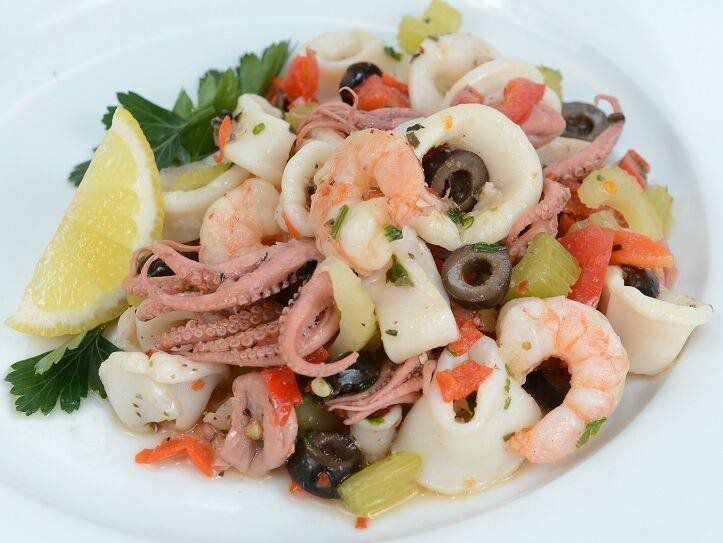 Ingredients :Squid, shrimp, celery, fresh baby octopus, olives, salt, vegetable oil, lemon juice, oregano, white pepper, artichoke hearts, fresh red bell pepper, white vinegar, parsley, red pepper flakes, Peppadew peppers. Allergens: contains shellfish (shrimp); produced in a facility that processes tree nuts, soy and wheat. Made With Tilapia, Shrimp, Bay Scallops, Eggs, Spices, Just Mayo Mayonnaise, Fennel Seed, Parsley, Natural Pork Casing. Salmon, Just Mayo, and Lemon Pepper Seasoning. Lobster Rissoto - Made with arborio rice, lobster meat, Just Mayo, celery, onions, panko breadcrumbs and seasoning. Shrimp and Lobster - Made with shrimp, surimi, just mayo, edamame, lobster meat and spices. Smoked Salmon - Made with smoked salmon, cream cheese and seasoning. 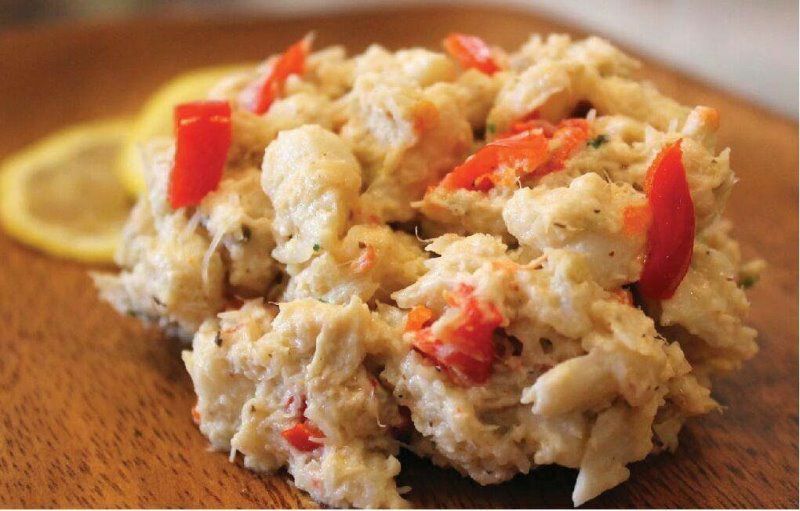 Jumbo Lump Crab Meat, Lump Crab Meat, Peppadew Peppers, Cod, Mayonnaise, Salt, Pepper, Parsley, Lemon Juice, Cayenne Pepper, Spicy Brown Mustard Oregano, Celery, Onion, Panko Flake. 5 lb. Pack.